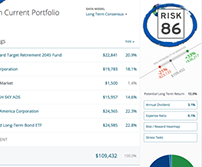 Click below to take this short quiz to see if your investments are in alignment with your risk tolerance. IMPORTANT: The projections or other information generated by Riskalyze regarding the likelihood of various investment outcomes are hypothetical in nature, do not reflect actual investment results and are not guarantees of future results. Results of this tool may vary with each use and over time.